That's right... tomorrow morning, Angels & Demons, the movie comes out. But even better: Roaring Forties Press will publish Rome's Angels & Demons: the Insider's Guide. It's my free ebook with inside information about the art and places in Dan Brown's book. And you will be able to get your FREE copy right here! I always get excited about giving gifts, so here's one last teaser before the big reveal! Castel Sant’Angelo is a labyrinth of rooms, chapels, dungeons, and lavish living quarters—all of which are open to the public. The building spirals up into the sky and down into the earth and feels like a rabbit warren after centuries of adaptation and renovation. At several points in history, popes have been forced to flee the Papal Palace through il Passetto, taking shelter in the fortress. In the split second it took Langdon to take in his surroundings, he realized he was in a sacred place. The embellishments in the oblong room, though old and faded, were replete with familiar symbology. Pentagram tiles. Planet frescoes. Doves. Pyramids. Although the Church of Illumination is fictional, a visitor can easily believe that secret chambers exist in Castel Sant’Angelo, where dark deeds and secret plots have been hatched for centuries. 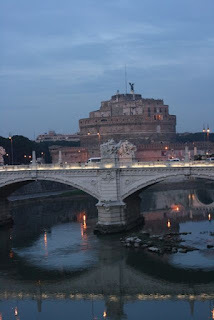 Some Angels & Demons fans are a little disappointed to find that the Hassassin would have had a hard time keeping four cardinals captive in Castel Sant’Angelo—the entire building, including the dungeons and the opening to il Passetto, is open to the public as a museum. So, what will you get tomorrow? Well, Rome's Angels & Demons: an Insider's Guide is filled with information about the historical figures, churches, artwork, and locations that figure prominently in Angels & Demons. With maps, visitor information, photographs, and in-depth insights, it is a great guide to the city of Rome and the fascinating world Dan Brown has created. It's great for your Kindle -- or any other reader you might have. Plus, it's formatted so that you can print it and take it with you. Imagine: you, your honey, sprinting through the streets of Rome... solving cryptic puzzles and preventing murders... I know. I can see it, too! See you tomorrow for the launch party of Rome's Angels & Demons: an Insider's Guide, my free guide for book and movie lovers everywhere! Plus, I might just have a few other tricks up my sleeve! Ciao! Can't wait! Been following all the developments ... and wish I had another Rome trip scheduled already! I read Angels and Demons a couple of months ago. Am looking forward to see the movie.